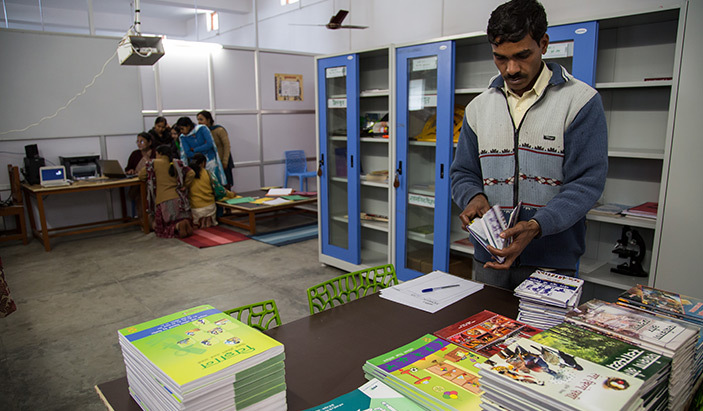 The Teachers’ Resource Laboratory which has been funded by ORACLE works towards improving conceptual clarity, sensitivity and instructional methods of teachers in the primary grades in the domains of language, science and mathematics in select clusters of Uttar Pradesh. Researches indicate poor performances and competencies of children from government schools in the domains of language, math and science. CARE India’s Girl Education Programme (GEP) believes, that to tackle the issues of poor academic performances and learning outcomes, work needs to be done directly with the stakeholder that directly delivers education, viz. teachers. Lack of domain trained teachers for specific subjects, high pupil to teacher ratios in schools, insufficient in-service teacher’s training within current government framework and lack of continuous follow-ups and hand-holding support has directly created a massive motivation deficit for teachers, thereby hampering the quality of delivery for students in government schools, most of whom belong to impoverished and marginalized sections of the society. As part of this project, GEP has ‘layered’ the TRL on existing government platform of teachers’ training, i.e. ‘Cluster Resource Centres’ (CRCs). This translates to the refurbishing of the CRC space and provisioning it with teachers’ learning material (TLM), which are developed using easily available materials. Monthly meetings of teachers held in these centers are also made vibrant, active and fruitful for teachers. Teachers are also given continuous and handholding support through joint regular visits of CRCCs (Cluster Resource Centres Coordinator) and GEP representatives to schools.